For several years Jesus Calls Ministries anticipated for the Lord to mandate the Ministry to minister in the city of Jabalpur. It was a Joyful moment for the Dhinakarans to visit the city of Jabalpur to minister and pray for the multitudes, after 34 years. Rev. Joel Patrick, Vice President, Diocese of Jabalpur, Mr. Suresh Jacob, Rev.Dinesh Ramtek, Pastor David Lal and the organizing committee members joyfully welcomed the Dr. Paul Dhinakaran and Sister Evangeline Paul Dhinakaran at the Airport on 26th October, 2017. An organizers get-together was held on the same day, for the Dhinakarans to personally meet and greet the organizers and pray with them for God to bring a revival in the City of Jabalpur. Dr. Paul Dhinakaran and Sister Evangeline Paul Dhinakaran met with Jesus Calls Partners and their families personally, and prayed for them in the Partners’ Meet held on the morning of the 27th October 2017. Nearly 3000 partners came from Jabalpur and places surrounding Madhya Pradesh, to hear the word of God and receive His blessings. A wonderful time was spent by the Dhinakarans with the partners of Jesus Calls ministry in encouraging them to abide in the Love of Christ Jesus. 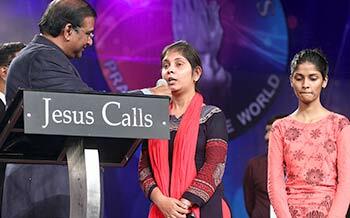 The Dhinakarans prayed personally for hundreds of partners who were in desperate need of deliverance. Many miracles, healing and deliverance from demon possession were witness at the Partner's Meet. Jesus Calls conducted the ‘Jesus Calls’ Prayer Festival at Jabalpur seeking God’s blessings for the people of Madhya Pradesh. The meetings were held every evening at Christ College School Ground in Napier Town from 27 - 29 October 2017. Various Church Leaders and pastors participated in the meetings. Large crowds of people eagerly came from different States like Bihar, Maharashtra and Uttar Pradesh in addition to the people from Madhya Pradesh. All the three days of the meeting were glorious for each and everyone who participated. God loves the people of Jabalpur, unconditionally! It is His love that drew these hundreds of thousands to the Jabalpur Prayer Festival. People started to gather from the afternoon at Christ Church School Ground for all the three days of the Jabalpur prayer festival. Over 65, 000 people gathered eagerly each day, waiting to receive blessing and deliverance of the Almighty. God moved mightily through Dr. Paul and Sister Evangeline. People were delivered as they were hearing the Word of God and many were healed during the time of prayer. The thousands, who gathered, witnessed a great day in their lives, having felt the mighty touch of the Lord. The Karunyans took a major role in various events of the Prayer Festival. They led the gathering in worship through singing and choreography and also during prayer time the served the ministry by praying and anointing the people with oil. Numerous testimonies piled up each day at the end of the meeting and everyone who participated in the Prayer Festival witnessed the healing and deliverance of the Lord. These three day's meetings went live on webcast and many viewed through Facebook. Live telecast was on Sathyam and Sadhana TV channels. SEESHA provided free accommodation and food for those who had travelled a long way to participate in the meeting and the people who were in need. God in His divine mercy enabled Jesus Calls Ministry to establish a Prayer Tower in Jabalpur and inaugurate the same as the 100th Prayer Tower in India (114th Prayer Tower Worldwide) on the 28th of October 2017. The Dhinakarans inaugurated the Prayer Tower in the presence of The Most Revd, Dr. P.C. Singh, Moderator CNI Synod & Bishop, Diocese of Jabalpur, Rev. 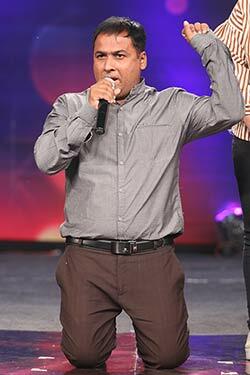 Dinesh Ramtek, Senior Pastor, AG Church, Church leaders, Partners & well-wishers. From the age of 5, Rupa has been suffering from unbearable stomach pain and an evil spirit tormented her to kill herself. She had sleep walking problem; added to that, her UTI infection often compelled her to end her life. Every morning at 6.30, she watch Jesus Calls TV program. When she came to the meeting, her name was the first name to be called by Dr. Paul. Dr. Paul said, “Rupa, God has touched you right now. I command the evil spirit that wanted to kill you to go out of you in Jesus name. And God is healing your stomach pain also.” When Dr.Paul prayed for her as such, she felt a great relief in her body and she is sure that she is healed. 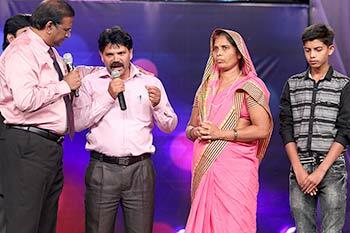 Naresh Vidhwani with his family praised God for the marvellous healing they received. He had screws fixed to his knee making him unable to walk. The doctors told him that he would take over a year to recover. When he was watching a Jesus Calls TV Program he heard Dr. Paul Dhinakaran pray for the healing of the leg. He prayed along with me and immediately sensed the healing touch of the Lord. He then forced the doctors to remove the screws and proved to them that the Lord healed Him. 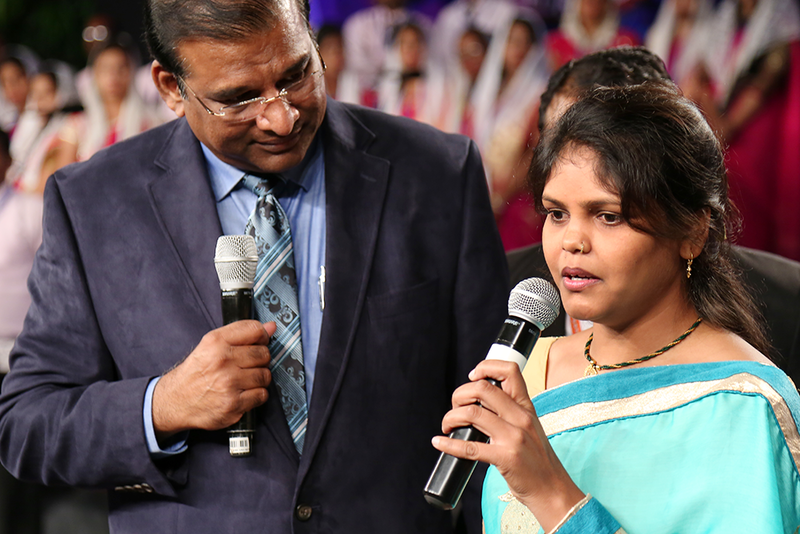 His daughter Isha also testified about the deliverance and the anointing of the Holy Spirit she received in Raipur Prayer Festival. 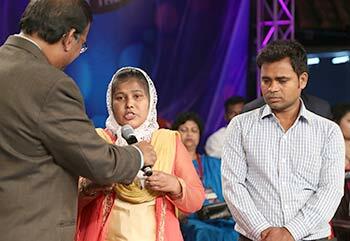 God revealed Dr. Paul Dhinakaran the name "Esther" and promised her that she will be healed. Likewise she was delivered from severe headache and dizziness that she has been battling with. She glorified the Lord by gladly testifying to the thousands, the deliverance she received from the Lord. Ruth was sailing the rough sea. A few years ago she lost her husband; poverty struck her and her daughter abandoned her. She had been eagerly looking for deliverance in her life. The Lord assured her deliverance by revealing her name to Dr. Paul Dhinakaran during the first day of the Jabalpur Prayer Festival. She testified to the gathering, the peace she received on hearing the comforting promise of the Lord. "Radhika, Jesus touched you right now. Your family life shall be blessed from now on" These promising words from our Lord, revealing her name and giving her great comfort drove her to testify the peace she and her husband received. 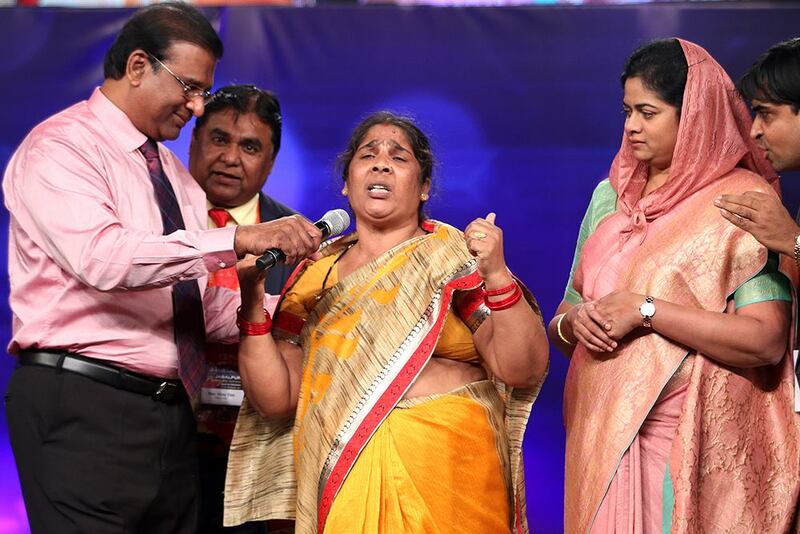 She testified that her sorrows that were bothering her departed when she heard the Lord reveal her name to Dr. Paul Dhinakaran and comforted her with the word of promise. Ram Pyari was possessed and afflicted by the evil spirit for the past five years. She testified about the deliverance she received during the Jesus Calls Partners meet that took place on the morning of the same day. She affirmed that the evil spirits were cast out of her as Dr. Paul Dhinakaran looked up to the Lord in prayer. She came on the stage completely redeemed and delivered from the clutches of the evil one. Anjali Devi was tormented by the evil spirit due to which she faced great difficulty in life. She had a miscarriage that left her broken-hearted. Moreover, she has had sleepless nights for several years. An ill-feeling that somebody is with her and a constant thought that something is not right, wrecked her soul. She attended the Jabalpur Prayer Festival for her deliverance and she took a vow to testify to the gathering if she is delivered. She testified on the second day of the meeting that last night was the first night that she slept peacefully. She thanked the Lord for rescuing her from the evil spirit. Kalpana was possessed by an evil spirit for thirty long years. She received her deliverance when Sister Evangeline bound the evil spirits and unleashed the mighty power of God through her prayers. Kalpana found great peace and joy of the Lord which she will carry all through her life. What a mighty God we serve! Abdul came on a wheelchair for the second day of Jabalpur Prayer Festival, traveling 200 kilometers from across, with an enormous tumour on his left thigh. He was unable to walk because of the excruciating pain. He testified in front of the thousands, the healing he received during the time of prayer. He sustained his testimony by demonstrating his ability to walk at ease, stirring up great faith in the hearts of the multitude. Amarapalli was possessed by demons for several days. The evil powers led her to pick up conflicts with her parents and her husband, making her lose her peace. She became sick and was unable to urinate for the past three days. Her thirst to be delivered got quenched as Sister Evangeline prayed with the anointing of the Holy Spirit, on the previous evening. 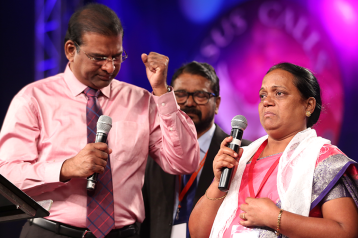 Amarapalli testified with a great relief that the Power of the Holy Spirit has transformed her life that she reconciled with everyone with whom she had conflicts. Praying for the people's deliverance is the deepest concern of Jesus Calls Ministry. These prayer festivals are the key to reach people and pray for them that they can receive the deliverance and anointing of the Holy Spirit. The Lord strengthened the Dhinakarans to deliver His marvellous word to the thousands who thronged at the venue. The hearts cry of Jesus Calls Ministry is to see the people forever delivered and healed that they will praise the Lord with their body, mind and soul. Jesus Calls Ministries conveys its sincere thanks to all the Pastors and ministers of Jabalpur, Organizers, Partners and Well-wishers for enabling thousands of people to receive God's healing, deliverance, freedom, and restoration.